The approximately 80 people who attended the Jan. 12 meeting of the Siesta Key Association (SKA) would not have been surprised by the arguments the nonprofit’s attorneys have put forth in a complaint they propose to file in the 12th Judicial Circuit Court in Sarasota. 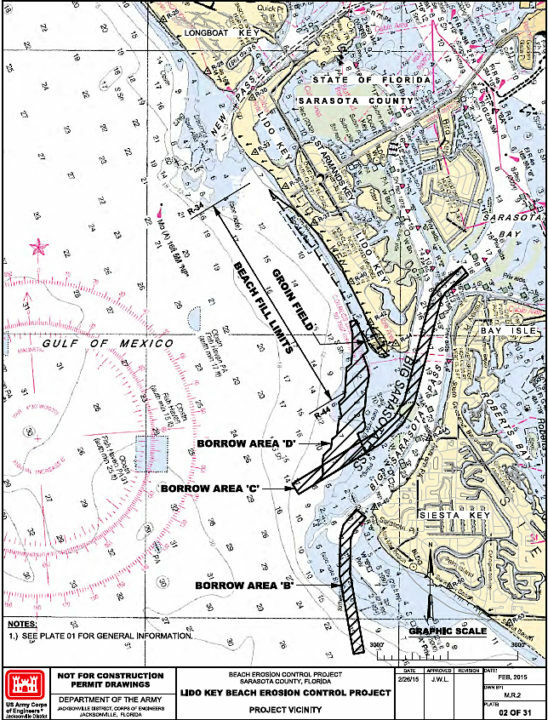 A draft of the document — provided on Jan. 19 with a letter to the Florida Department of Environmental Protection (FDEP), the U.S. Army Corps of Engineers (USACE) and Mayor Willie Shaw of Sarasota — argues that FDEP’s issuance of a permit to the City of Sarasota and the USACE to dredge Big Sarasota Pass to renourish about 1.6 miles of South Lido Key Beach would violate policies in both the City and County of Sarasota comprehensive plans. Robert Luckner, a member of the SKA’s Environmental Committee, used graphics during the organization’s Jan. 12 meeting to explain the research he and Catherine Luckner — the SKA’s vice president — had undertaken, contending that portions of areas in the pass from which the USACE proposes to remove about 1.2 million cubic yards of sand are within the geographic boundary of Sarasota County. Big Pass, the SKA draft complaint says, has never been dredged. Further, the document cites the Florida statutes in making its argument that the activities authorized by the FDEP permit, in regard to portions of county territory, would have to be consistent with the county’s Comprehensive Plan. The draft complaint explains that the Circuit Court “has jurisdiction over this proceeding pursuant to [Section 403.412 of the Florida Statutes].” That is part of the state’s Environmental Protection Act. The draft complaint was completed on Jan. 19, according to the letter, which was sent on behalf of the SKA by its Tallahassee law firm, Hopping Green & Sams. The final version will be served on the city and the USACE “and not filed until 30 days thereafter in accordance with section 403.412(2)(c) [of the Florida Statutes],” the draft complaint says. The letter sent to the three defendants points out that FDEP “shall have 30 days after receipt of [the draft complaint] to take appropriate action.” In the event it does not, the letter continues, “the Plaintiffs can file the verified complaint in circuit court seeking the appropriate injunctive relief” and the recovery of attorney’s fees. Siesta Key resident David Patton also is a plaintiff in this action. 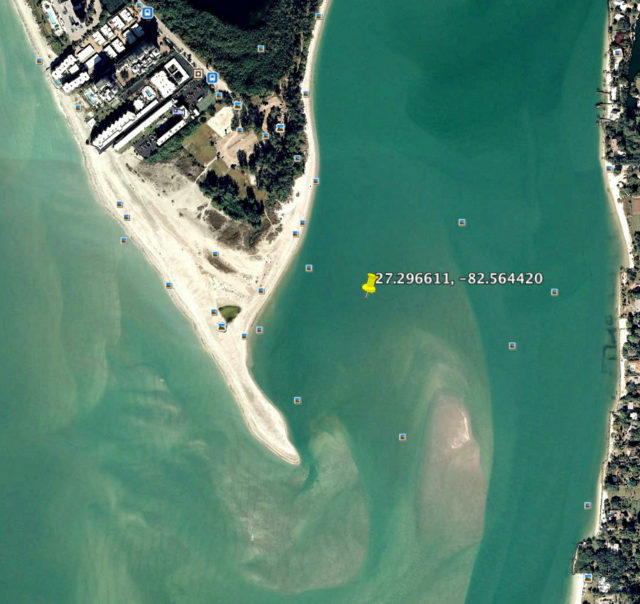 A long-time resident of the island, he additionally is a party to the administrative challenge the SKA filed earlier this month, seeking a hearing on FDEP’s announced intention to issue the permit to the city and the USACE for the Lido project. During its first regular meeting of the year — held Jan. 10 — the county commissioners heard an update on the status of the permitting process and the filing of two administrative challenges by that time — action taken by Save Our Siesta Sand 2 (SOSS2) and the Florida Wildlife Federation. No board member made a motion for a county response. 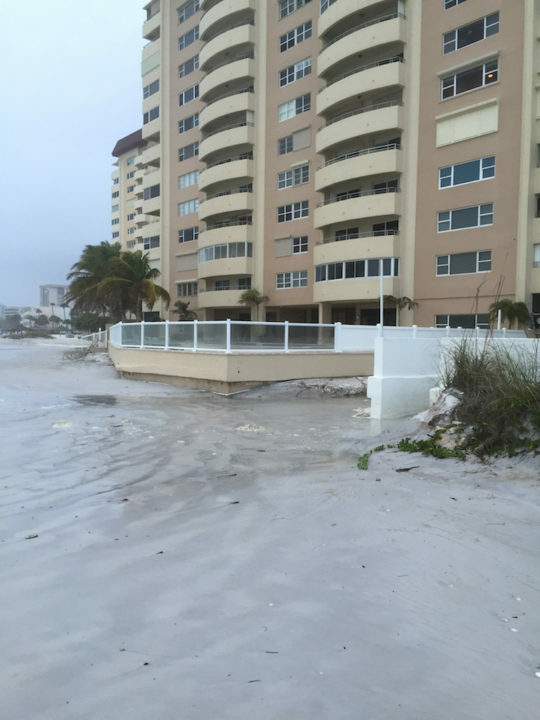 The night before the SKA released the draft of its complaint to the public, City Manager Tom Barwin told The Sarasota News Leader he “did a lot of tossing and turning,” as waves in the Gulf of Mexico pounded Lido’s shoreline. 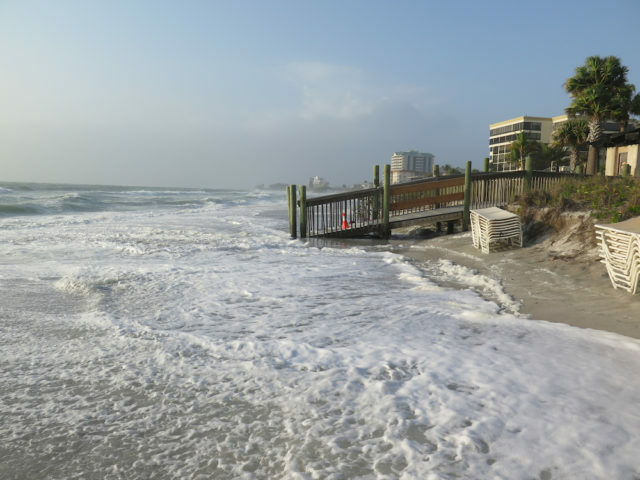 Two residents of the barrier island independently sent the News Leader photos taken on Jan. 22 and 23, depicting the proximity of the surf to one condominium complex, especially. “We are not the boy crying wolf,” Barwin said in a Jan. 23 telephone interview with the News Leader. “We are going to begin practicing emergency notification measures,” he added, and consider whether to conduct practice evacuations of South Lido in coming months. The timing of the FDEP’s issuance of the permit for the Lido Renourishment Project would have enabled the city and the USACE to undertake the work this year, which includes construction of two groins on Lido to help hold sand in place between subsequent renourishments, Barwin pointed out. He also worried that the threat of litigation would prevent inclusion of the federal share of the project cost in the 2018 federal fiscal year budget. Late last year, Susan J. Jackson, a spokeswoman in the USACE District Office in Jacksonville, told the News Leader that the federal agency had asked that the approximately 62% of the total expense of the Lido renourishment plan be included in what the USACE refers to as “the President’s budget” for 2018. The city’s current Capital Improvement Plan — unveiled during budget workshops in the summer of 2016 — show $11,780,000 in the form of a federal grant to help cover the cost. Another $3,610,000 in county Tourist Development Tax revenue — money set aside for beach renourishment in the city — and the same amount in the form of a state grant would cover the remainder of the expense. The USACE’s understanding, she added, is that the funding would not be held up because of litigation. 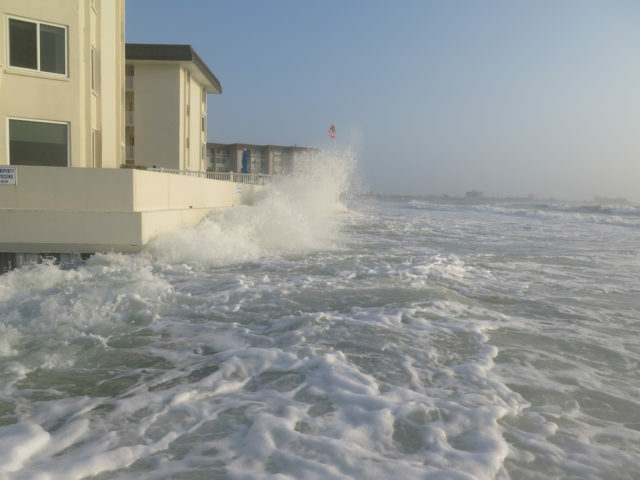 During the Jan. 3 City Commission meeting, Barwin talked of the potential for the Gulf of Mexico to breach the Lido shoreline during a major storm, creating significant damage to infrastructure and trapping residents on that part of the island. Regarding the plans for the project, he told the News Leader, “This is such a great opportunity to come together,” to collaborate on innovative ways to help the county’s environment.